Baby Boom Can you cut it as an employee of Baby Boom Inc? Can you cut it as an employee of Baby Boom Inc? Test your speed and reflexes in Manic Mode where the babies just keep on coming or practice your skills in the Free Play mode. Control up to 7 different mad machines and remember that babies don't bounce, they splat! 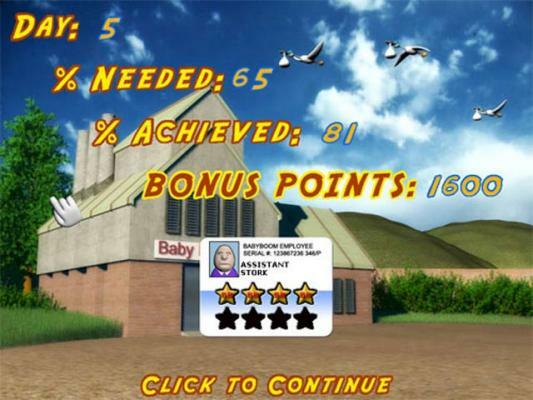 If you're after a fast paced arcade game with a sense of humor then Baby Boom is the game for you! 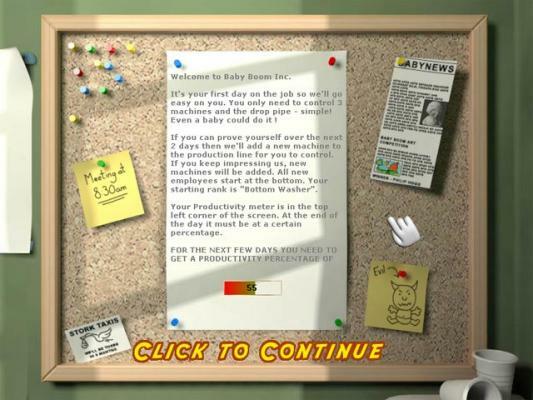 Baby Boom is a wacky arcade game with mad machines, excellent graphics and addictive game play. Three Different Game Modes to play - Manic, Story, and Free Play. 7 different mad machines featuring the bib-o-matic, flight-Sim and drop pipe! Unlimited play time in Manic Mode - Can you beat the high scores? Save Game feature so you can return to the last level you failed on.